Will Bonsall has worn many hats since going “back to the land,” including prospector, draftsman, gravedigger, hobo, musician, logger, and artist, among others; however, he considers subsistence farming to be the only true career he ever had. He is the director of the Scatterseed Project, which he founded to help preserve our endangered crop-plant diversity. His first book, Through the Eyes of a Stranger (Xlibris, 2010), is an eco-novel set in a sustainable society of the future. 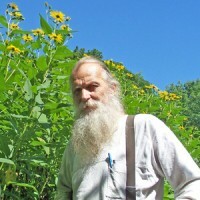 He is also the author of the Essential Guide to Radical, Self-Reliant Gardening: Innovative Techniques for Growing Vegetables, Grains, and Perennial Food Crops with Minimal Fossil Fuel and Animal Inputs. Will lives and farms in Industry, Maine, with his wife, Molly Thorkildsen, and two sons. Caryn: Hey everybody! How are you doing? Good. Let’s move on. Shall we? Great. I’m really excited about this, to bring out my next guest who I discovered through Chelsea Green publishing, I really love that house and I’ve talked to a number of authors from that publishing company. Will Bonsall has worn many hats since going back to the land including: prospector, draftsman, gravedigger, hobo, musician, logger, and honest artist, among others. However, he considers subsistence farming to be the only true career he has ever had. He is director of the Scatterseed Project, which he founded to help preserve our endangered crop plant diversity. His first book, Through the Eyes of a Stranger is an eco-novel set in a sustainable society of the future. He is also the author of the Essential Guide to Radical Self-Relying Gardening: Innovative Techniques for Growing Vegetables, Grains and Perennial Food Crops with Minimal Fossil Fuel and Animal Input. Will lives and farms in Industry, Maine with his wife Molly Thorkildsen and two sons. Will how are you doing today? Will: I’m doing fine Caryn, how are you? Caryn: Good. I really, really enjoyed spending time with your book. Will: I think you did very well to read it all in the time since I last talked to you. I see a notice that it’s pretty extensive, it’s a pretty long thing. You could have done War and Peace in half the time of that. Caryn: It is dense. It is intense. I took a lot of notes. I like to think that one day – I live in New York City in an apartment building with a terrace, but you know there is a part of me that longs to grow food. If that ever does happen, your book is going to be right there with me guiding the way. Will: I hope you find something useful in it. Caryn: Thank you. There’s so many interesting things to talk about especially from a book of 400 pages. Lets just start with simple concepts that you talk about like eco-efficiency. Which you mention you thought you had come up with but then found others use the same term with similar definition. I want to connect that with permaculture and organic gardening because I know my listeners are interested in that. Can you riff on that? Will: Yeah you bet. Those are two very interesting comparisons and contracts you’re making because they both are similar but different. Knowing what I think of the mix of your radio audience, I would point out in the very beginning that one of the things distinct about my “veganism” is it is not primarily predicated on what I call bunny hugging or compassion or ethical and things like that. Although, those are totally all good reasons. I don’t know of any bad reasons to be a vegan. I tend to avoid ideology per-say in my writing, particularly in that book, because I’m trying to appeal to people who are – I like to not just preach to the choir. One of the arguments, in fact my main argument initially for going vegan and veganic in my farming system and how I grow what I eat, and you refer to it as eco-efficiency. The fact that it’s simply un-ecological, not business-like, I always like to refer to that because we tend to be rather cynical and we’re not too moved by someone saying this is some unethical thing. We like to think we are all sensible, at least rational people. Someone points out that this is irrational, that appeals to something a little more visceral. That’s what I’m trying to do. So you make the analogy, comparing it with organic- one of the points you found in my book that I emphasize is I initially started off my working career in the mining business – prospecting and so on. I didn’t like it, it’s a rather dirty business and I got out of it. I wanted to get into something more recycling. What could be more recycling than organic farming? I started hearing and reading about, “Well if you use so many tons per acre of phosphate and lime and all these things, all these things that are mined somewhere.” I asked myself, “I thought I got out of the business. Why is that so crucial to organic farming?” My book, among other things, deals with some of those issues of how to be a farmer without being a miner. You also reference the permaculture thing. Again, even though I’ve seen a true permaculture system is really the ideal of sustainable agriculture, of sustainable food system. The usual method I hear, the usual techniques I hear apply to permaculture basically involve growing a lot of things from seed to an animal and then eat the animal. To me, that basically nullifies the main advantage of permaculture; not killing and all that kind of stuff. When you put that stuff through an animal then you loose so much of the efficiency of it, like 90% throwing away. I just don’t get it. I think there is something more organic than organic and I think there’s something more permaculture than permaculture. Those are the things I’m trying to aim at and discuss in a lot of my books. Caryn: I have a thing with the word efficiency and often I don’t like when it’s used because a lot of industry, for example will use efficiency to obtain certain goals. They will support efficiency in their terms. Efficiency is not always the best thing. Especially when people’s livelihoods are at stake. Will: I think real efficiency always is the best thing it’s just that we often call things efficient that are not really. The things you refer to. You implement the bottom line. That’s one of the things in my book I try to make sure we’re looking at the real bottom line. When we say that this makes sense or this doesn’t make sense it’s often because we are not allowing for the externalities of it. That’s the very thing you’re referring to. For that same reason, I sound frankly pragmatic and am about if we want efficiency, real efficiency, bottom line efficiency, not just something that has the appearance of being efficient. Caryn: The appearance of being efficient means the highest profit at any cost. Caryn: That is the question isn’t it? One of the big concepts that I really enjoyed early on and I don’t think I’ve ever thought of it this way – the real sustainability is this cycle that you talk about where we grow crops, we eat them. So we’re taking, then we put all of that right back in the same place. We’re not mining somewhere else. Grabbing stuff from somewhere else. We’re keeping everything right in that same place. Beautiful. Will: Round and round and round and round. If we do have to import something into the system there are some things certain trace minerals for example that simply are not there, for whatever reason. Maybe you do have to bring them from somewhere else. Sometimes tons of acres of this or that. To me, that’s mining and it’s not really sustainable and it’s not really organic. Caryn: That’s right, but we’re not there yet. You talk about this imaginary futuristic society. Will: Oh now you’re in the other book now. Caryn: No! You did it in this book. Will: Oh that’s right, I did reference it because it was sort of my take on my point of reference. About a place called Esperia, yeah thank you, that’s right. Caryn: I mean, it makes me want to read the other one. I love the idea of having an image of what life could be like because I feel that when we imagine it we can ultimately make it so. Will: You can’t build on anything without a blueprint first. Even if it’s just simply in your head, or lines on a paper, you can’t start the build – you have to have the vision. The main thing that that novel proposes or offers, is a vision. No ultimate – “the vision” – but one of a number of possibilities for a sustainable civilization. Actually, what purports the protagonist of the story, the fellow Yaro, and what happens to him and so on- is really the backdrop, the context of the story what appears to be the context of the story, the land of Esperia, is in fact the protagonist. That’s the real character, is this world. Caryn: Well I want to read it. Is it 400 pages? Will: No, it’s a little bit shorter actually. It’s 365 I think – it’s a novel size. Incidentally there’s a sequel to it that I’m finishing almost as we speak. I’m just putting the finishing touches these last couple weeks on a sequel and the two together are called The Yaro Tales. I call it a “bilogy” as opposed to a trilogy. The first one, the one that’s referenced in the book, is called Through the Eyes of a Stranger. The sequel is called In the Larger House. The reasons behind those titles are alluded to it in the book when one figures out what they’re called. It’s basically a possible vision of a sustainable society, which incidentally is vegan. The Yaro’s adopted nation of Esperia, they are vegans, mainly partly because of compassion and that kind of stuff. But they basically need to maintain an advanced civilization on a finite footprint but with a large enough population to be able to defend themselves and so forth without undermining their base. Caryn: Well you’ll have to let me know when that’s out and we’ll have to talk about that on another program. Will: That would be a lot of fun. Caryn: Yeah, so you have so much knowledge and you’ve built so many different things on your land. You cover everything from equipment to seeds to recipes to growing, nurturing the soil – so many different topics. When did you – were you born into this? Will: Far from it. I was raised less than an hour from here. Waterville, Maine. Middletown. My dad was a mail carrier; my mother was a telephone operator. We had a small garden. I can’t say I was part of the back to the land movement because like most of that movement, I was not going back to the land – I was going back to something I’d never came from. Caryn: So you just kind of figured this all out over the decades…? Will: Exactly. It took me a lot longer then it would take most people because being a guy – I don’t ask questions I just figure it out. Then I do it two or three times and eventually I figure it out. Caryn: Well sometimes that’s a great way to learn. Will: I won’t say it is, it’s just the way I do things. But you commented on the range of the book of my gardening book, that’s all the fault of my editor. When they approached me they told me they had this idea. They thought I’d like to do a book – particularly on grain growing since I’m known for small scale grain growing. Sure, I can do that. And what about this other things you do? Farming without manure, yeah I can do that. It went on and on and I threw out ideas and everything I said yeah, they basically gave me Carte blanch to write a book about everything I know and then some. That’s what you got. Caryn: Let’s talk about veganics and gardening without manure and humanure. Will: OK. What will we talk about it? Will: You give the direction and I’ll follow. Caryn: OK sounds good. Now I’ve talked to a number of people who do veganic gardening and I learned from some that it came out of necessity, not really any concern about animals. They were just in a location where they didn’t have animals. So, they learned how to nurse the soil without animals. Will: I know quite a few people and that’s exactly it. In fact, some of them are meat eaters. They live in the suburbs or something and they don’t have access to animal manure but they have glass clippings and they have leaves and things like that. The exact components of my system. That’s a very good point. Will: Well sooner or later you would. I’ll be devils advocate here. If you’re going to keep animals…initially when I first came here I was not eating meat but I was going to have dairy goats. Well how do you have goats, you’re going to have surplus 15:06 you’re going to have old goats. Somewhere along the line someone else has to and that’s again my key focus to keep looking at the bottom line. Simply slugging a problem off to someone else is not really solving the problem. That’s when I started realizing that there’s got to be a way of doing it without those things. Right along with it came the question of manure. What about the do-do? That was when I first started realizing the do-do does not amount to much in terms of fertility. It’s the mantra of organic gardening. Cow pies are what make the world go round. But, in fact animal manure as the book explains in some detail is ultimately not a source of fertility at all. The fertility ultimately comes from the plants and grain and hay that the animal ate and the manure is simply a bi-product of someone else keeping and killing and eating animals. In terms of building the soil, conventional organic gardening by which I mean using livestock manure, doesn’t actually build the soil at all. It barely tries to maintain the soil. But the only thing Mother Nature does is by use of primarily force. Either grassland, prairie or grassland where there is enough water for is. This is the ultimate eco-efficient system. A system that produces with so much more – so much more bounty in one form or another whether directly as food or as food for the food – but as so much more than it itself requires. So if you really want a system where the bottom line is the big fat product then you really need to be looking at plants, not only on your table but to maintain the soil. Grass in particular, leaves – leave forest residue and are really right where it’s at. Caryn: You told many stories and you have a great sense of humor. You also talk about how your editor took out some of your humorous anecdotes. Will: She was very indulgent. She had taken out some of them that probably would have been banned in Boston. They left most of the cheeky remarks and quips I made there that they let pass. They’re a wonderful publisher to deal with. They say, “We try not to muzzle our author’s voice.” And I can tell you that’s true. They didn’t muzzle me really at all. Caryn: I liked the concept of seeing value in someone else’s garbage and there are lots of ways to do this here in NYC. We have the freegans, we have the dumpster diver people who grab things that are thrown away. Sometimes its food sometimes its furniture and they see value in someone else’s garbage. I’ve seen it too with compost, and kitchen waste – throwing it away when it could be come compost. You talked about a woman, an elderly woman’s leaves that you used to take from her. Leaves! They’re not garbage. I can’t stand when I see people racking them and throwing them away because they’re ground right there needs them. Will: When I was a kid we burned them. Rake them and burn them. That’s a very good example because that woman herself- she did value them. She wouldn’t let me have all the leaves because she had a use for them, basically what I was doing with them. That was one of the examples I used to overturn the conventional wisdom that leaves don’t have much value and fertility in them. Her whole garden was based on leaves and nothing else. From that point of view, and mine too, the leaves are not a waste product. They are a primary harvest and then the food that grows from them is the ultimate harvest, for me. It’s a very different situation when people in urban areas have essentially had salvage ecology. Whether it’s the residue or old furniture and those kinds of things, which generally came from outside of the metropolitan limits or something. They were brought in there and they’re circling it round and round. They are functioning, like mushrooms, taking what is already there and moving it around which is very good for people in that situation. That’s the only choice you really have. But it’s the best choice you have. In my situation, I’m out where I have lots of those resources. I could be keeping animals and growing meat and milk and all that but I just find a much more efficient and easier way of doing the whole thing. That’s my compelling thing I try to emphasize that. I’m not trying to preach to the choir. I’m not trying to appeal to the higher motives. I’m trying to appeal to the grassroots instincts. This is easy, I’m lazy I don’t want to do all that work. It works! I managed to reach a lot of people who were not vegan and maybe go ahead and leave me still not being vegan, but a whole lot better than what they were doing before. It’s appealing to them wherever they’re at, not where I am or where I think they should be. Caryn: So let me ask you, you obviously have time to write – how much free time do you have? Will: Very little. In the wintertime the last few years have been particularly difficult because I was first doing the novel and then this last book you’re referring to. Then this winter kind of wrap up the sequels of the novel. I also do articles regularly. They take quite a lot of time. They’re the main things I do for money actually. My own contribution to the household is mainly from writing and speaking- which if you haven’t noticed I do a lot of that. Very fast and so forth. If I could get paid for words per minute I would be quite wealthy. But anyway, those are the things I do as outreach and I basically selling virtually nothing, very few of the things that I grow. They’re primarily for my own consumption and incidentally that’s what makes it a unique situation. We have a lot of market gardeners around here and CSA’s and stuff who produce food and send it off to market. As I emphasize in the book, that is one of two and perhaps not even the second one- sources of erosion. One is stuff leaching, washing away. But the other one is the food sent off to the market place. Well of course we don’t think of that as erosion- that’s what we’re doing it for. And yet when you think of the tongue breaker of calcium and phosphorous and nitrous and all these things, they ain’t never coming back. I mean, long ago before we had this marvelous invention called the flush toilet, there was a sort of a given symbiosis. A compact between the country and the urban areas because the urban areas weren’t so big, but what usually wherever you ate that stuff and pooed it out someone collected it, recycled it, and went back to the fields which were probably within a couple miles of the center of the village. We broke that cycle. We broke that contract with the Earth when we got the flush toilet. That stuff goes away somewhere. The best that happens with it, it doesn’t get back to the land that produced it. Caryn: There’s a lot that is broken in this society, no question about that. Even when we evaluate the gross domestic product we don’t consider the value. You talk about this towards the end of the book, the value of the food you’re producing on your land, it has no value. I mean, it has tremendous value! I want to grow food because there’s a part of me that doesn’t trust what’s going on in the world. I think there may be a time where it might be difficult to get food. For those who can grow it, you’re the richest people around. Will: For me, I grow a very large percentage of my food, but certainly not all of it, a lot of people say we grow all the wrong food here and we don’t. Other people I’ve heard say they don’t either when they look at everything. But I do grow a disproportionately large amount of my food, particularly the expensive parts of it – fruits and vegetables and some of the grain and every time I’m in the middle of getting my tax form ready. There’s no line on my tax form for the value of the food that I grew and ate. I can’t put it down, if I wanted to put it down so I can’t pay taxes on it because I’m both the producer and consumer. The middleman and everything. Caryn: I want to jump around now. It’s the Jewish holiday of Passover. I’m not a religious person; you mention you’re an Atheist. I am also someone who does not believe in a higher authority. You were talking about allium and we all love onions and garlic or frying- you were talking about that. I just want to read here, “Just as how we are addicted to the flavor of alliums is reflected in the story of the Exodus. People of Israel are trekking around the Sinai having recently escaped the land where they endured slavery and genocide. Does anyone say hey guys this manna stuff really hits the spot. No! They keep kvetching about how much they miss the onions and garlic and leeks they had back there.” Then of course you continue tradition in the garlic is something not to be eaten. I don’t the onion and garlic are eaten in the Jane society. I just found that humorous. Will: I think I mention in there supposedly the alliums are not conducive to spiritual development. I eat them all the time and I’m an Atheist! They nailed that one. Caryn: I love onions and garlic and leeks especially when they’re cooking. Will: Almost anytime someone comes into the house and they comment, “Oh something smells really good.” It’s always one of two things. It’s either onions or garlic frying or it’s some yeasty bread baking. Those things seem to be highly evocative smells and flavors. Even if we are cooking something that we really may love to eat, the smell of it doesn’t seem to quite get our juices going quite like those alliums. Caryn: Right. I always love when I discover new things. I wanted to talk about some of those things. You talk about using oil meal and using it instead of oil. Can you talk about what that is? Will: Yeah. Basically there are the oil seeds – those crops that we grow to press oil from them. Like, cotton seed, canola, sunflower seeds, sesame – all those things that are grown like industrial scale agriculture. We use oil to fry things to make mayo and dressings and things like that. Fairly early in the game we were very serious about this – growing our own food. We said, “What about the oil?” All the people that think they’re being so self-reliant because they’re growing their mescaline and salsa ingredients and buying all their grain. We want to really do this so what about oil? We tried growing a few things like canola and sunflower seeds thinking to press oil from them. Well at that time we didn’t have any technology to press the oil from them. We just went ahead and started not knowing how we were going to continue it. When we realized that it wasn’t practical to do that, it occurred to us that this has the oil in it already- the sunflower seeds – now there is all this other stuff in the seed too. All this protein and calcium and silicon and fluorine and things like that. If we were to press the oil from this and eat the oil which is the one part that our body can synthesize it’s own oil. Then take all that other stuff and feed it to a stupid mammal, a pig or goat or something and where is the sense in that? Since we’re so much into whole foods, instead of eating this extracted oil, what if we were to eat this seed in its whole form? So for years we developed a whole cuisine of making for example something sort of like mayo using whole ground up sunflower seeds, not pressing the oil but the whole seed. Fermenting it to make a sort of sour cream and all kinds of things like that. If we wanted to fry pancakes instead of putting some oil on the cast iron pan, get it real hot first and then sprinkle a little bit of ground sunflower meal on it and real quick, because it starts scorching, put the batter on top of that. Then you end up with your pancake all crispy and fried like it would of been an oil but it has this coating of not just oil but the toasted seed. Of course all the nutrition is there and you’re not throwing away the most valuable part of it. So yeah we get into that very much and in the more recent years we come back to it in someway so that we do use more oil then we used to. But we still from time to time get our act together and revert back to using as much as we can, using the seeds whole. We can grow canola here easily but you do have to extract the oil so the canola seeds we had were not useful for oil seed but we had tons of it and played around with it and discovered we can grow sprouts. They were very delicious not as an oil seed but as a winter vegetable sort of. We had a lot of going round and round of trying to grow our own oil and we came up with a lot of very interesting things as a result of the effort. Caryn: I always like to say when you restrict something you get really creative and your world expands. Will: Exactly! That and so many other things had that effect again and again likewise trying to avoid animal manure. We found so many other things – very serendipitous – we found things that were much more valuable then the thing we were trying to do in the first place. Sometimes failure can be delicious. Caryn: We have three minutes and I have like 25,000 things I want to talk about but I can’t. I want to talk about humanure and I want to talk about Gardens Without Borders. Will: Ok. First of all, Gardens Without Borders, that was the original working title for the book by the way. I love everything about the book except the title. When it was all done, the publisher came up with this objection, a totally valid one, she said, “Gardens Without Borders well it’s catchy and all that but a person will wonder what it means.” And I said, “Well as soon as they open the cover and the very first paragraph it’s spelled out really clearly.” And she said, “Well yes but that’s too late. When they’re standing in the aisle in Barnes and Noble you have to get them right away, or they’ll never get to opening it.” So they came up with the idea Will Bonsall’s Essential Guide to blah blah blah and I wasn’t happy at all with it. But, she was right. What had been the working title was not adequate. I think we should have come up with something a little different. But, the whole idea behind it is summed up in the very beginning. When you’re thinking about your garden, don’t just think about that bed. When you look beyond the edges of your garden I assure you it’s a mirage. There are no boundaries to your garden, it just goes on and on and on. In every sense- ecologically, economically, politically. The chairman of the board, the priest, the president, everyone is sitting right in the middle of your garden. It’s all these forces in society, you have to deal with all of them so don’t just think of your little garden as some kind of entity. It is part of a much bigger thing. For humanure it kind of ties in to the same thing. We don’t use animal manure because since we’re not keeping animals where would we get the manure? We would have to bring it in from somewhere else and we’re trying to avoid a system that brings stuff in from outside. As long as we’re here and as long as we’re eating we are going to have our manure. We live out in the country where we don’t have a septic field or a municipal sewage system; otherwise it would be a very different story. But since we are generating the stuff anyway it occurred to us, this stuff is really, really precious. It is far from being a waste product. Human beings eat probably better than any other species on Earth. We eat richer stuff and it’s got to reflect in our waste. So, even though our manure, our own feces could never be enough to drive the system, in terms of building our soil system it’s fairly insignificant. If you’ll pardon the expression, a drop in the bucket, or not even a drop in the bucket. So on the one hand it’s not enough to drive things. We’re really counting on the hay and the leaves and all that stuff. But on the other hand it is far too valuable that four to six or eight wheel barrels full a year of finished composted humanure is far too valuable to waste. Caryn: Okay, Will we are out of time. Will: There we go. That was fun. Caryn: I was fun and all this is so fascinating and we have so much more to talk about. I really am sincere I really want to hear when your next book is out and we can talk more about that. Thank you so much for joining me on It’s All About Food Will. I invite everyone to check out your Essential Guide to Radical Self-Reliant Gardening and Gardens Without Borders. Thank you! Well we’re at the end. I’m Caryn Hartglass and you’ve been listening to it’s all about Food. Find me at responsibleeatingandliving.com. Write me at info@realmeals.org and have a delicious week. Bye bye!